On Sale Now! Save 2% on the Full HD 1080p Hi-Res Mini Portable Smart Video Cinema Home Theater Projector - Built-In Dual Core Android Computer, WiFi Wireless Multimedia, LCD+LED, HDMI & USB Inputs for Blu Ray PC Laptop & TV by Pyle at Tobby News. MPN: PRJAND615. Hurry! Limited time offer. Offer valid only while supplies last. The Pyle PRJAND615 High- Resolution Smart Projector is a projector like no other. Build a rare and functional entertainment experience - right away! View More In Slide Projectors. The Pyle PRJAND615 High- Resolution Smart Projector is a projector like no other. Build a rare and functional entertainment experience - right away! With its mobile Operating System features, you can directly surf the web via high-speed Wi-Fi connection. You can connect it to your TV, PC, Laptop, Gaming Console, DVD Player, Smartphone, etc. and project your favorite audio, videos, and Images quickly and effortlessly! This projector is like a laptop, TV, and MP3 player- all in one! It has a user-friendly control & navigation interface for easy and convenient use. Also features USB Flash Drive & SD Memory Card Slot Readers and Blu-ray disc Support that you can use to watch your favorite movies, tv shows or video clips using your own flash drives.You can adjust its picture display size up to 120 inches. Enjoy its picturesque and intense picture with its native resolution of 1280 x 780 Pixels. Feel like you are in a real theater but in the comforts of your home. Connect to TV, PC, Laptop, Gaming Console, DVD Player, Smartphone, etc. WIFI NETWORK: This smart mini home projector has a built-in WiFi network that provides wireless streaming ability to connect to your device and a dual core android computer system. It is compatible to Blu Ray as well. COMPACT SIZE: A compact portable video projector that can be used anywhere. Very appropriate for classrooms, conference rooms, home theater and cinema experience, offices and more. Can also be taken on business trips, vacation and other travels. VERSATILE ENTERTAINMENT PROJECTOR: This portable entertainment projector is versatile since it is small. 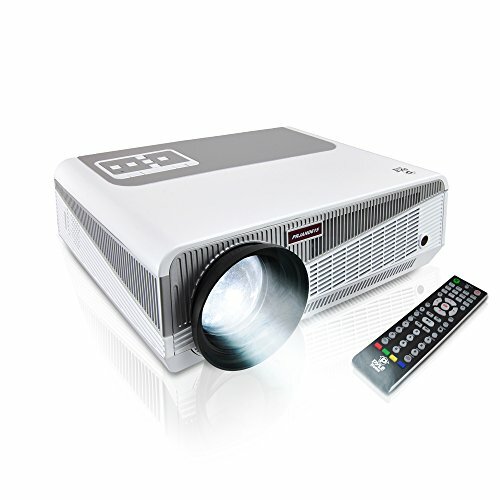 This can be used as a movie projector, computer projector, home theater projector and etc. FOR LAPTOPS & PC: Other than the compatible iPhones, iPads and Android smartphones, it's also compatible to Blu Ray. Can project images, videos, games and powerpoint presentations from laptops and PC using USB Flash Drive reader and HDMI connector for HDTV. HD 1080P PROJECTOR: Next generation smart professional multimedia home theatre projector which presentations show pictures, movies and videos from your smartphone device. Projects high definition resolution of 1920x1080 or full HD video projector 1080p.